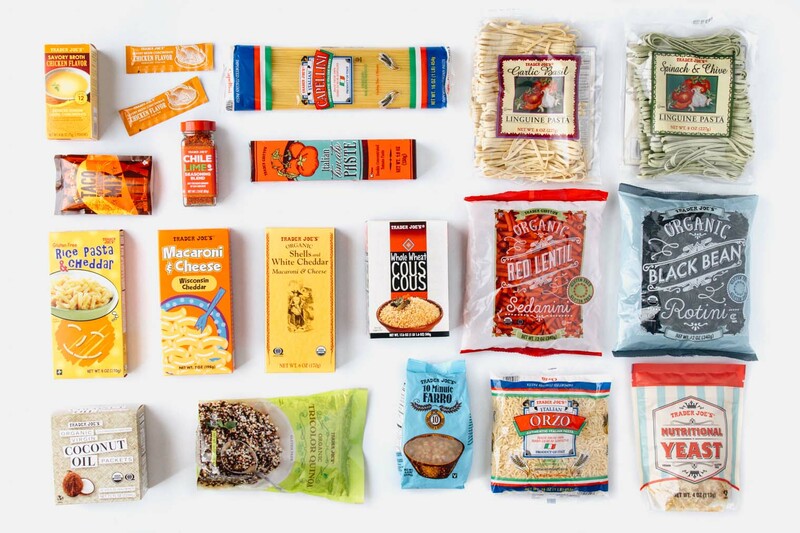 A guide to finding lightweight, calorie-dense snacks and meals for your next backpacking trip at your local Trader Joe’s. Meal planning for an extended backpacking trip can sometimes feel more daunting than the actual hike itself. Sourcing enough lightweight, calorie-filled foods can be a challenge, never mind comparing labels to determine which option gives you the best nutritional bang for your buck. 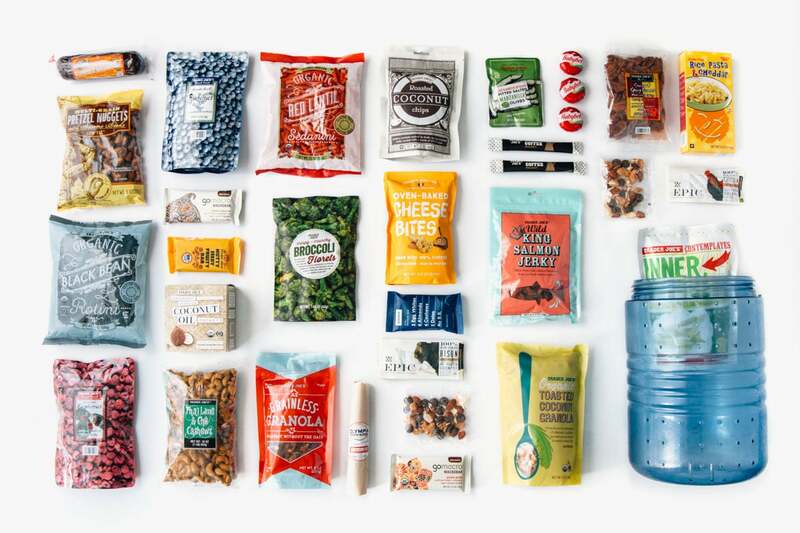 While there are many backpacking food products available online, all of them are useless if you decide midweek you want to go on an impromptu weekend getaway. 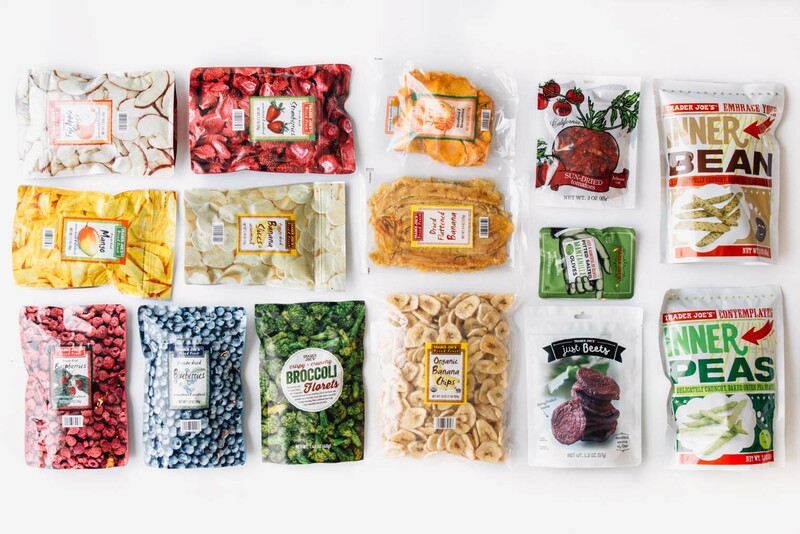 In the past, we’ve had to postpone trips or settle for boil-in-bag meals just because we didn’t order the right supplies ahead of time.That is until we discovered the bounty of backpack-ready food at our local Trader Joe’s. That is, until we discovered the bounty of backpack-ready food at our local Trader Joe’s. This article is not sponsored or endorsed by Trader Joe’s. We just love shopping there. Although Mr. Joe (or is it Captain Joe? ), if you’re reading this, we would love to talk. We have been shopping at Trader Joe’s for as long as we can remember buying groceries as adults. But it wasn’t until recently that we realized just how many of their products can be used for backpacking. Dehydrated fruits, nuts & seeds, jerkies, energy bars are only the tip of the iceberg. 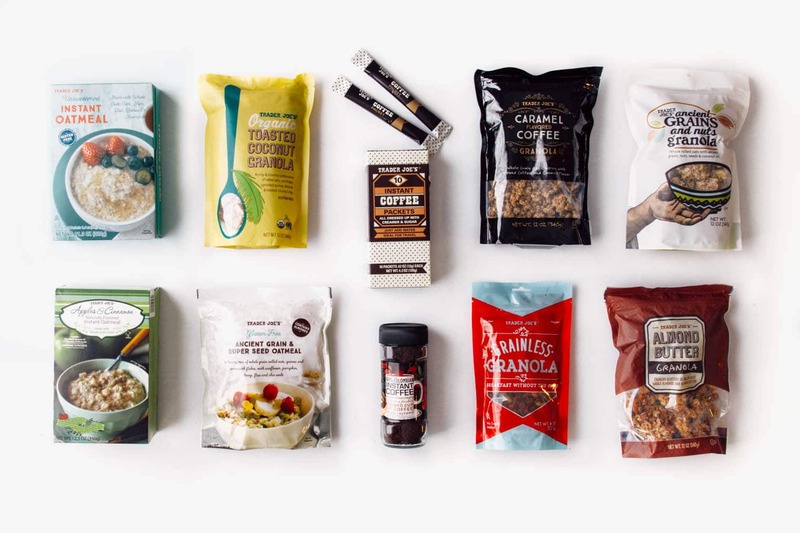 They also carry things you wouldn’t expect: like individual packets of coconut oil, freeze dried vegetables, and baked cheese bites. When you put it all together, it’s a backpacker’s bonanza. But where to start? What products have the best Calorie to weight ratio? What about protein to weight ratio? Are there any good vegan options? What about gluten-free? Well, you’re in luck because in this article we’re going to break it all down for you. 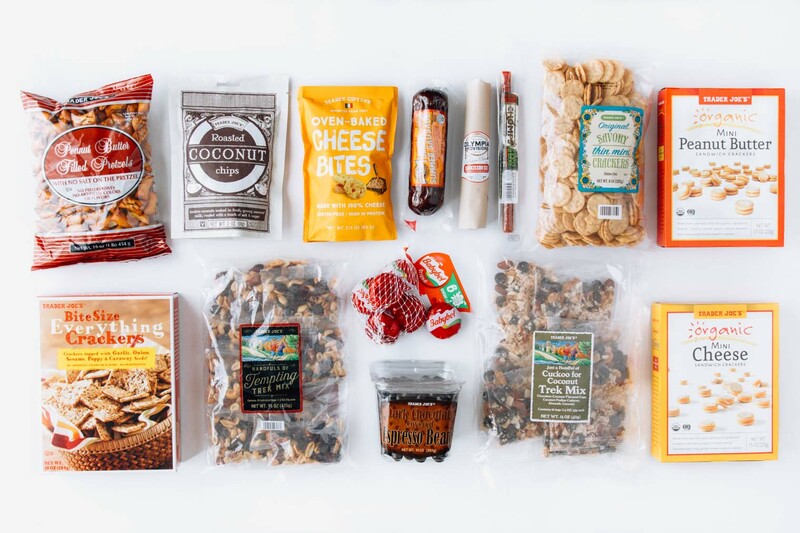 Here’s our comprehensive backpacker’s guide to shopping at Trader Joe’s. Want to see the foods with the best calories and protein per ounce? We round up the top performers at the bottom of the post. Set yourself up for a successful day on the trail with a good backcountry breakfast. Whether you like crunchy granola or a warming bowl of oatmeal, Trader Joe’s has a variety of lightweight options to start your day off right. Editor’s Note: These individually packaged instant coffee sticks make it super easy to ration, so you only bring the coffee you need. They even include the cream & sugar. Editor’s Note: For those of us who enjoy our coffee black, this instant coffee can be repackaged in a baggie so you’re not stuck carrying around the jar. Editor’s Note: These come individually packaged and you can use the packaging to cook the oats. Tear the top, add hot water, and let sit for two minutes. No bowl required. Editor’s Note: Enjoy as is or doctor up with freeze dried fruit & seeds or nuts. Lightweight, calorie dense, and shelf stable. Nuts and seeds are classic staples for backpackers. But these days, a handful of almonds can cost you an arm and leg. 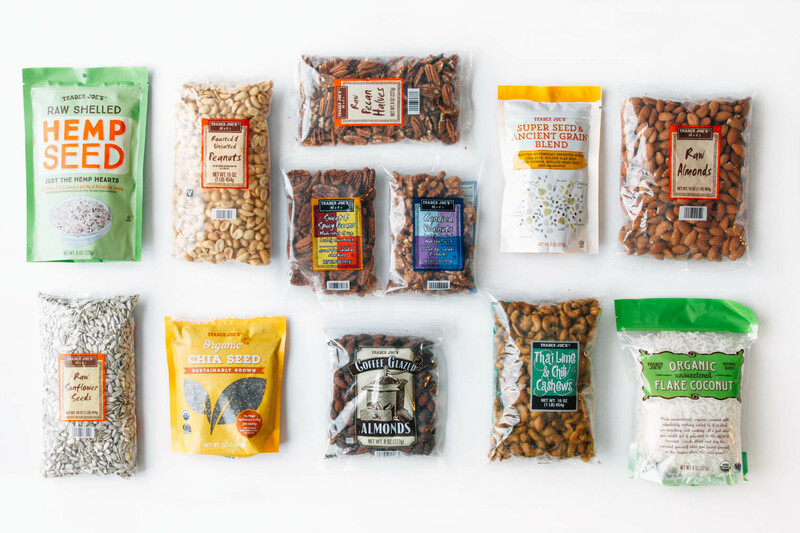 While we can’t say they’re always the cheapest, we’ve consistently found Trader Joe’s to have very competitive prices for nuts and seeds. Many of which are offered raw, preserving their macronutrients. Editor’s Note: Also comes in an almond variety. Editor’s Note: Also comes in a cashew variety. Editor’s Note: Also come in a pecan variety. Editor’s Note: These come pre-shelled, so you don’t have to worry about packing out any shells. While the most neglected part of most backpackers’ diet, we believe in getting our fruits and veggies in for the day – even if we’re out on the trail. The key, of course, is making sure that produce weighs as little as possible. Thankfully and somewhat inexplicably, Trader Joe’s hosts a range of freeze dried and dehydrated options. Editor’s Note: While “green peas” and “delicious snack” might not be words you generally associate together, you’ve got to give these a try. We can’t not eat the whole bag in one sitting. Editor’s Note: Remember that Lay’s potato chip ad “Bet You Can’t Have Just One?” Imagine that, but with mangos. Editor’s Note: These would be great to throw into mac & cheese. We haven’t tried rehydrating them, so we can’t speak to what that would do texture-wise, so add them at the end as a topping. Editor’s Note: The salty, savory taste of olives can be a welcome change of pace from typical trail food. Have them as a snack or cut them up and toss them in your pasta for dinner (like we did in this backpacker’s chicken marbella). Editor’s Note: These make a great addition to any pasta meal. When we’re out backpacking, lunch is less of a distinct meal and more of an all-day grazing event. There’s no main course. We just take a little from here and little from there. Trader Joe’s offers a variety of trail food and more substantive meats & cheeses for when you want to sit down to refuel mid-day. Editor’s Note: Pre-portioned bags make it easy to stash these in your hip belt pockets for snacking on the move. Editor’s Note: Need a little help in the self-control department? After you try this trail mix, you just might. Thankfully it’s pre-portioned, so you don’t end up devouring the whole bag in a single go. Editor’s Note: These are a fairly new offering at Trader Joe’s and they are maybe the single best snack in the whole store. Editor’s Note: While there are lots of cracker options at Trader Joe’s, we really like these because they are pretty sturdy and won’t turn to dust in your bear barrel. Editor’s note: While not as durable as the aforementioned crackers, if you’re in need of a gluten free option, these will work. Editor’s Note: These bite-sized caffeinated espresso beans make for a great afternoon pick-me-up to get you back on your feet after lunch. Love them or hate them, energy bars are often an essential part of a backpacker’s diet. They are definitely not a meal but can work in a pinch. While Trader Joe’s has a pretty good offering of bars, what’s remarkable about them is how cheap they sell big name brands. Clif bars for 99 cents, yes, please! Editor’s Note: We were blown away by this bar. 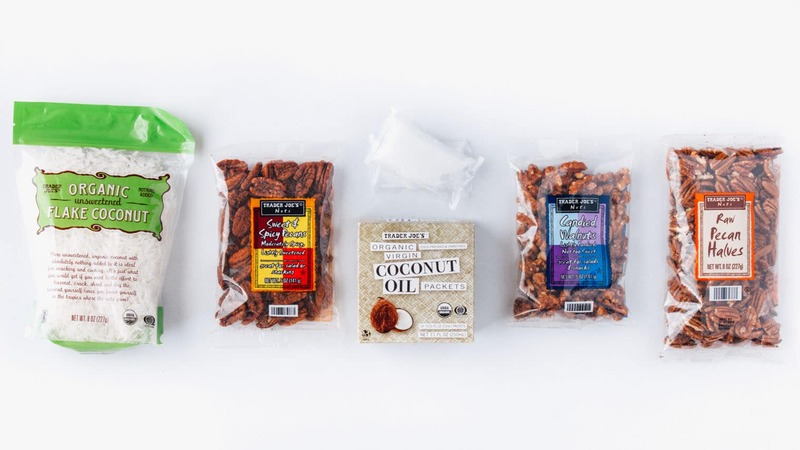 Hands down the best calories per oz of all the energy bars we tested, naturally sweetened, vegan, and gluten-free. It does have a lot of fat, but it’s all coming from nuts, seeds, and coconut (you’re going to burn it all off anyway). 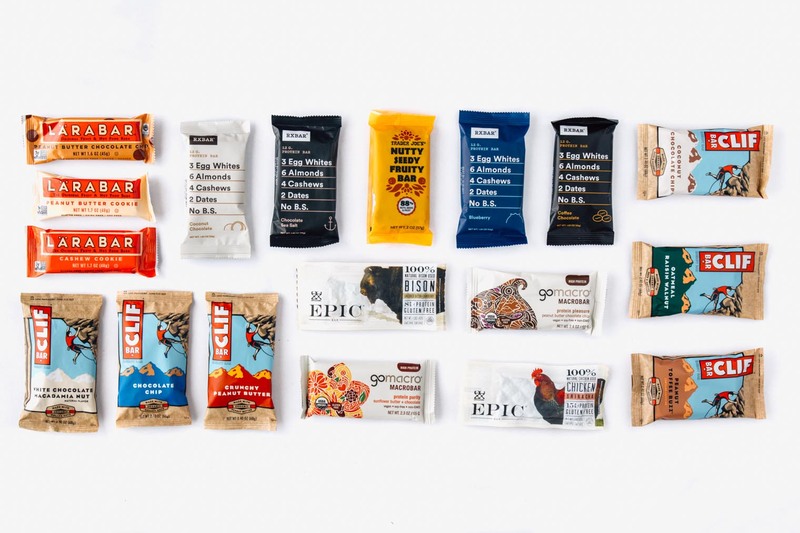 Editor’s Note: We’ve eaten a lot of Clif bars over the course of our lives, and this one is far and away our favorite flavor (although variety is the spice of life). It’s easy to hyper-focus on overall calorie count, but if you want long-lasting energy you’ll need to make sure you’re getting enough protein, too. 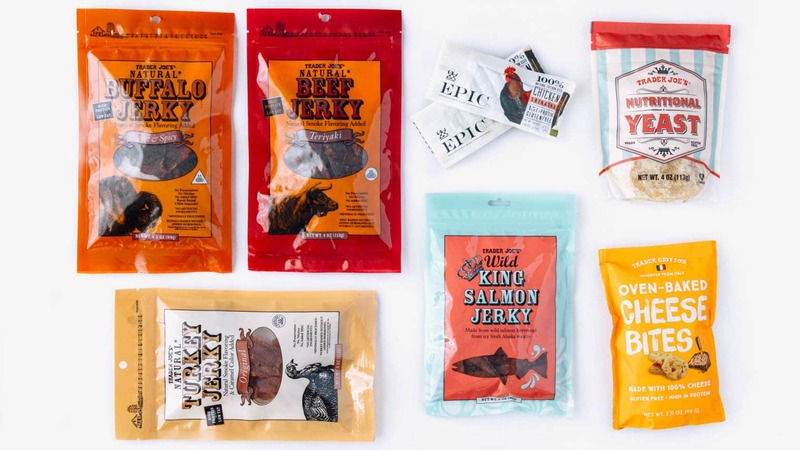 Jerky is lightweight, shelf stable and protein-packed. 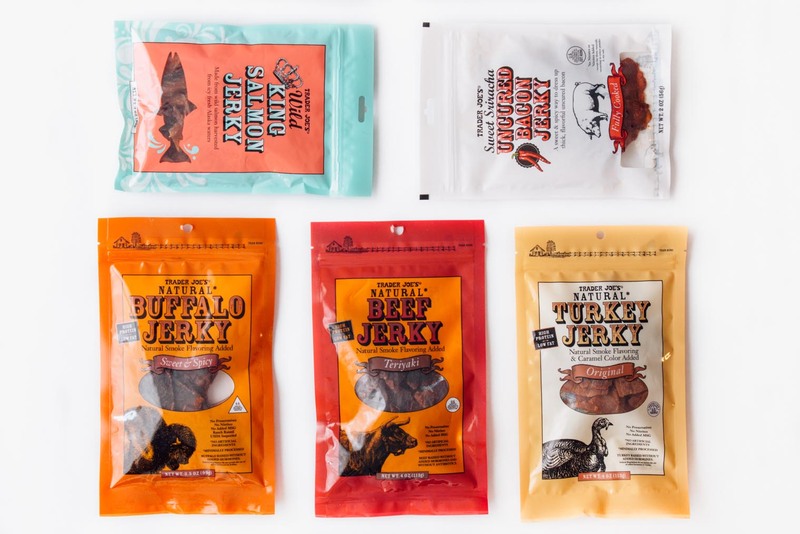 Trader Joe’s offers a range of jerkies that will give you plenty of variety on your trip. Editor’s Note: If you have been looking for a way to get some more protein into your breakfast routine, your search is over. While boil-in-bag meals have their place, sometimes you just want a home-cooked meal – even if you’re in the middle of the woods. Trader Joe’s has a lot of lightweight and calorie-dense building blocks to allow you prep your own meal. Check out our archive of backpacking recipes to see how you can incorporate real ingredients into your backpacking meals. Editor’s Note: With 7 grams of protein per oz, this black bean pasta is a lot more than just a bowl full of carbs. Editor’s Note: Cooks in 5 minutes. Editor’s Note: Cooks in 4 minutes. Editor’s Note: Cooks in less than 10 minutes and is excellent for building one-pot pasta dishes. Editor’s Note: Cooks in 2-4 minutes. Editor’s Note: Perhaps the fastest cooking grain of the lot, couscous only needs about 5 minutes in boiling water to fully fluff up. Editor’s Note: These single-serve chicken broth concentrate packets are an awesome way to boost the flavor of couscous, farro, quinoa, or even pasta. Editor’s Note: Nutritional yeast, or “nooch”, lends a cheesy kind of flavor to foods and is a complete protein in addition to being packed full of B-12. Editor’s Note: We are big fans of carrying olive oil packets while backpacking, but sadly TJ’s doesn’t carry them. But, imagine our excitement when we saw that individual coconut oil packets are now on the shelves! This is a great way of stuffing extra calories into oatmeals and dinners. Editor’s Note: We’ve yet to try this idea, but we imagine that a little tomato paste plus water and oil would make a pretty tasty pasta sauce. Editor’s Note: While it really doesn’t offer much nutritional value, this seasoning has a great tangy, slightly spicy kick that would be great in mac & cheese, pasta, or couscous. Of all the ingredients we examined, these were the top performers in terms of calories per ounce. Could you eat only these items on a backpacking trip? Maybe? Should you? Absolutely not. But they are good ones to know about and incorporate into your future backpacking diet. These are the top performing ingredients in terms of protein per ounce. If you find yourself getting hungry on the trail after eating a meal, consider incorporating some of these long-burning, protein packed fuels into your diet. Any other Trader Joe’s fanatics out there? What are some great meal combinations you’ve come up with? Let us know in the comments below or tweet us @freshoffthegrid! Loved the article. Going on a Long Trail hike and taking the freeze dried broccoli (yes it does rehydrate well, maybe just a tad mushy). TJ’s supplied lots of my super-foods. This is great, thanks! Going to take some suggestions for my upcoming trip! Do you have any recommendations for drink mixes / electrolytes from TJs? Do you know how much one packet each of all the items cost? Trader Joe’s changes their pricing pretty frequently, which is why we decided not to include unit cost. Unfortunately, you’ll have to check your local TJ for the most accurate price. How can I find out the shelf life, especially dehydrated or freeze-dried and jerky?? Yeah, I’m a prepper…. If you’re looking for long-term storage, I don’t think Trader Joe’s is the place for you. They won’t have any specific info on shelf life. 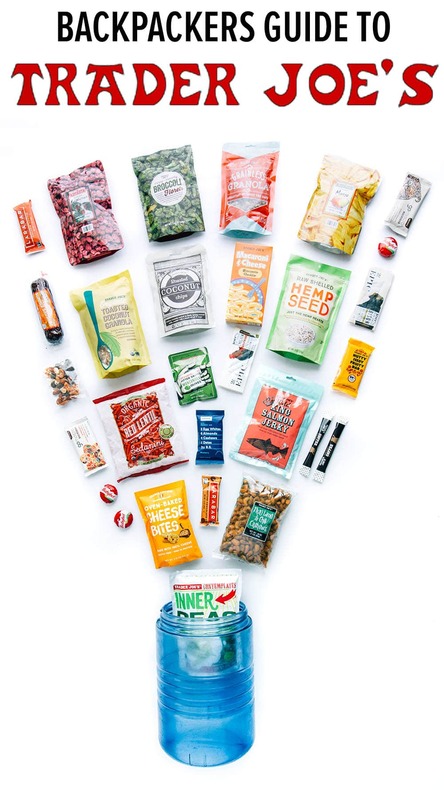 Freeze-dried and dehydrated will last a long time, but the packaging is what you will need to worry about. Trader Joe’s packaging isn’t designed to last 5-10 years. It’s all consumer grade material. So it will likely break down and let air in over a long enough period of time. Thanks to your fantastic article, I went to Trader Joe’s today and spent $90 on groceries/snacks to try out in the name of research for my upcoming PCT thru-hike. I look forward to eating my way through the meal planning prepartion portion of my hike. This article is gold! Saved! Awesome! Glad it came in handy. Meal prep & development is one of favorite parts of the process! Thanks for a great article! Just had a weekend backpacking trip and my friend brought along the coffee sticks. I had already had one of my instant packets when she offered me one of hers for my second cup. Sooo much better than what I had and a lot less expensive. Definitely stocking up at TJs for the next trip. If you enjoy creamer with your coffee those TJ stick are definitely the way to go! What do you use for milk? I have been using TJ’s for backpacking the last 15 years, with many of the items in your listing being perineal favorites. Often, I camp at the trailhead the evening beforehand and treat myself to an easily prepared frozen offering at TJ’s like the cioppino or fettuccine with clams. They even keep my drinks cold on the drive and help fuel me for the workout to come. Thanks! We might have to do a whole article about ways to use TJ prepared meals at a campsite. They taste so good, are easy to prepare, and (relatively speaking) pretty cheap. Sounds like you’ve got a good system down. Never had it before, but we’ll have to try the fettuccine! When we camp we usually make tin foil meals and get alot of quick heat and serve items from TJ’s and the xfer to foil packs. Not a bad idea. We’ll have to give that a try next time. Those TJ frozen meals are just too good sometimes. This list, while incredible, just makes me frustrated that the nearest Trader Joes is 1400 miles (Anchorage to Bellingham,WA). Time to call on friends and family to send care packages! They also have dried mini-cheese Tortellinis that are great for backpacking! THANKS for an awesome list. This is such a wonderful and informative post! We’re planning a road trip this summer and this info will come in super handy. Thank you, thank you, thank you! Great list, thanks for sharing! TJ’s used to have a roast beef hash in a foil bag that was awesome for backpacking, but I haven’t seen it in years. That’s too bad. We love us some hash! TJ is notorious for cycling through new products. We’ll try to keep this list updated as new products are released and old ones are discontinued. This is GOLDEN. Such a treasure trove of info, WOW! Seriously, you guys went so above and beyond and I’m so happy you did. Talk about a solid resource to have on hand. We have our go-to’s just for camping foods but sometimes it IS something we have to order in advance online and navigating the shelves of an actual store can feel overwhelming. Particularly loving the breakdown of the protein by ounce top performers, we always find it so hard to keep our protein intake up on the trail and it’s SO NICE having this to reference. We still have yet to go on our first backpacking trip but are slowly getting up the supplies (and the gumption) to do it, so this will really come in handy for us knowing what will fit in the bear barrel. Good to see all these items included in one TJ’s trail food article. Forgot the TJ’s Coconut Macaroons and Chocolate Covered Espresso beans. Shopping for an entire backpacking trip right before heading out sounds stressful – so happy to hear that this will be useful to you!! I think it’s a bit more of a novelty than a practical option (pretty expensive, comparatively), but have you been to Pirate Joe’s? We stopped in when we were traveling through Vancouver and it’s a pretty funny place. I also go to Washington to hike. Research the rules, not many foods are restricted… Which is not to say anything about Trader Joes… I have American friends that stock up to bring back food from there… but it will make your planning easier.